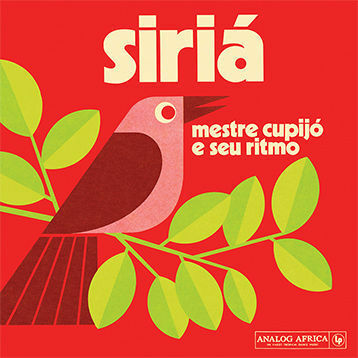 The next Analog Africa release, to be released on 31 March, will be a collection of material from 1975 - 1982 by Brazilian artist Mestre Cupijó, entitled 'Siriá'. Siriá is a cross pollination between the music of the inhabitants of the quilombos, a Brazilian hinterland settlement founded by escaped African slaves, and the indigenous people of the Amazon rainforest. Mestre Cupijó has created the modernised version of this local music, which has been igniting street parties and traditional festivals across the state of Pará in Northern Brazil for decades. Relatively obscure even in the rest of Brazil, Siriá will finally be celebrated internationally - and it might well become the feverish, tropical sound of this summer. Analog Africa's latest release sees them heading to Latin America for the third time - after two Colombian releases, the 'Diablos del Ritmo' compilation and 'Mambo Loco' by Anibal Velasquez - this time to Brazil. Cametá, a historical little Amazonian town on the shores of the river Tocantins, is the birthplace of the scorching music style known as Siriá; a cross pollination between the music of the inhabitants of the quilombos, a Brazilian hinterland settlement founded by escaped African slaves, and the indigenous people of the Amazon rainforest. Mestre Cupijó has created the modernised version of this local music, which has been igniting street parties and traditional festivals across the state of Pará in Northern Brazil for decades. Now in 2014, the combustible sound of Siriá will finally be celebrated internationally - and it might well become the feverish, tropical sound of this summer.